Whether you are planning a day out in the park or heading to the beach, the VonShef Picnic Backpack is perfect for al fresco dining. Influenced by Nordic design, the vibrant white and gray geo print is undeniably stylish. Compact and practical, the backpack features an aluminum-foil insulated cooler compartment to keep food chilled for longer - essential on hot summer days. The backpack is made from hardwearing 600d polyester and features a waterproof outer layer that will keep the contents of your bag dry. It also benefits from an extra pocket with two zipped areas - ideal for keeping your valuables secure. In addition, there are two detachable insulated bottle holders within easy reach - ideal for holding bottles of wine, a flask or water when out on long hikes. The matching picnic blanket has a waterproof PEVA backing to the underside; that will keep you and your belongings dry if the ground is damp. When not in use, the rolled-up picnic blanket attaches neatly to the side of the backpack with chrome buckles. 4 PERSON LARGE PICNIC BACKPACK SET: Everything you need for the perfect picnic for 4! 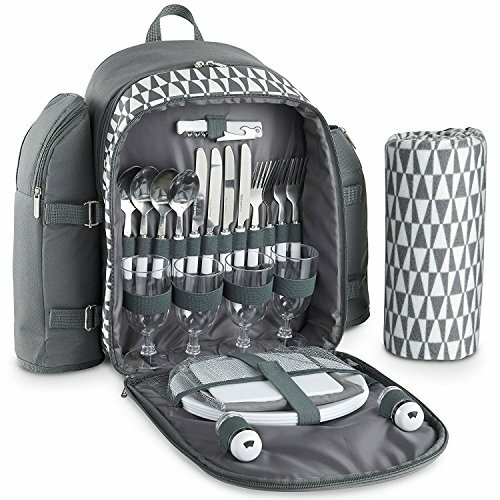 Includes 4 x stainless steel knives, 4 x stainless steel forks, 4 x stainless steel spoons, 4 x dinner plates, 4 x wine glasses and 4 x cotton napkins. 4 x salt and pepper shakers to keep your food seasoned, 1x cheese knife, a plastic chopping board to cut bread and cheese on and a handy bottle opener. INCLUDES LARGE PICNIC BLANKET: Also comes complete with a large matching 53 x 45 inches approx. fleece patterned blanket with waterproof PEVA backing. INSULATED COOLER COMPARTMENT: Cooler compartment keeps food cooler and fresher for longer. Great for cold meats, sandwiches, bagels, cheese, fruit, dips and desserts. PADDED SHOULDER STRAPS: Features soft padded shoulder straps for comfort and a top-mounted carry handle. DIMENSIONS: The backpack measures L 12" X W 8" X H 16" Inches and the blanket measures L 45" X W 52" Inches when flat and L 16.5 X D 6 Inches when rolled up.